How many backgrounds can you use on one card?? I layered Blue Bayou, Not Quite Navy and Soft Sky. 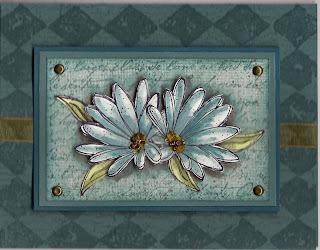 The main card was stamped with Print Pattern and Weathered in Blue Bayou. The center Soft Sky layer was stamped with French Script and Canvas in Bayou Blue, Canvas again in Sahara Sand and the splatter from Itty Bitty Backgrounds in Close to Cocoa, Blue Bayou and white craft ink. The flowers have gold/brown beads adhered with Crystal Effects. You do great work. The colors are wonderful on all your cards. WOW! This is beautiful! I also love background stamps. All of your projects are absolutely gorgeous! I can't wait to check your blog each day! Absolutely beautiful. Love the look. I have always loved your stuff. Yes I stalk you,lol.